The likelihood of being attacked by a wild animal is lower than you might think. Generally and animals instinct is to flee and will only ever be on the offence if they feel threatened. Attacks can also occur if food is scarce and you (unfortunately) fit the bill and is usually an act of desperation. Surviving a dangerous encounter on safari with leopards. 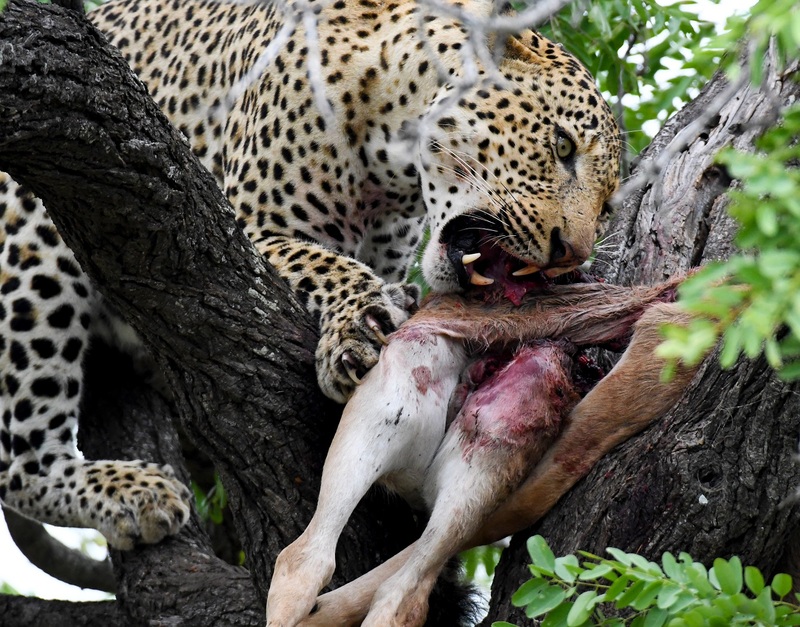 Contrary to popular belief, Leopards are least likely to attack a human, especially if it’s injured itself and won’t be able to hunt optimally. Like with most animals, the Leopard will only attack if it feels threatened, or will generally target children for ease. i. Never approach a Leopard too closely. If you spot Cubs, stay away. The mother of the cubs is very likely to smell your presence from afar before you can even notice them in sight. iii. In the event you are confronted by a Leopard – make loud noises by clapping your hands, shouting and wave your arms. This makes yourself appear bigger and increases your chances of them backing down and walking away. Never EVER run away. This can kick in a chase instinct in the Leopard. When it’s safe to do so you should back away slowly. But be sure to STOP when they take a step closer to you. Surviving a dangerous encounter on safari with lions. 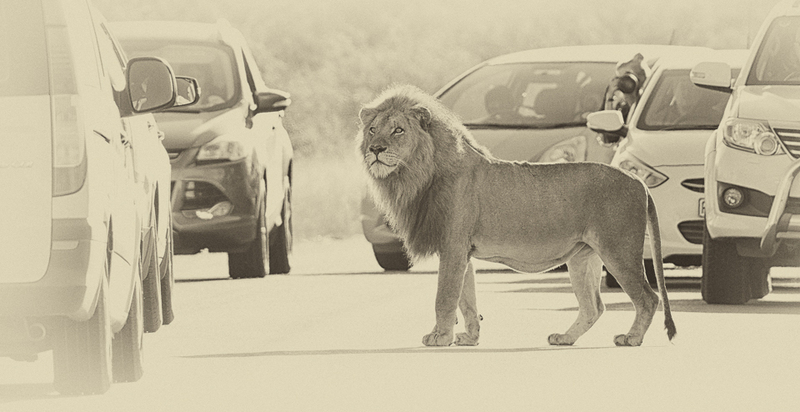 With increasing popularity of walking safaris – it’s made Lions perceive humans as more of a threat to their car-based counterpart. i. Lions can reach speeds of up to 30mph so an attempt to run is futile. Lions are very used to a chase, so standing in your tracks actually increases your chances of survival. ii. Never approach a Lioness with cubs as they will be far more protective and on the offence. iii. As mentioned with Leopards, be especially cautious with children during the night time as this is when Lions are at their most active. Surviving a dangerous encounter on safari with bears. Bears are the largest land carnivore on the planet and often considered as one of the most dangerous too, particularly in the North Americas. i. If you encounter a Bear, immediately speak in a calm and soothing voice to show a Bear that you are not a threat to them. If they’re still not walking away, try and figure out how to stand out of their way so they can pass. ii. Keep talking calmly to a Bear as you try to pass through, leaving the same distance as that of your initial encounter. iii. If you are being charged at – having pepper spray handy can lower the defence of the Bear giving you a chance to escape. 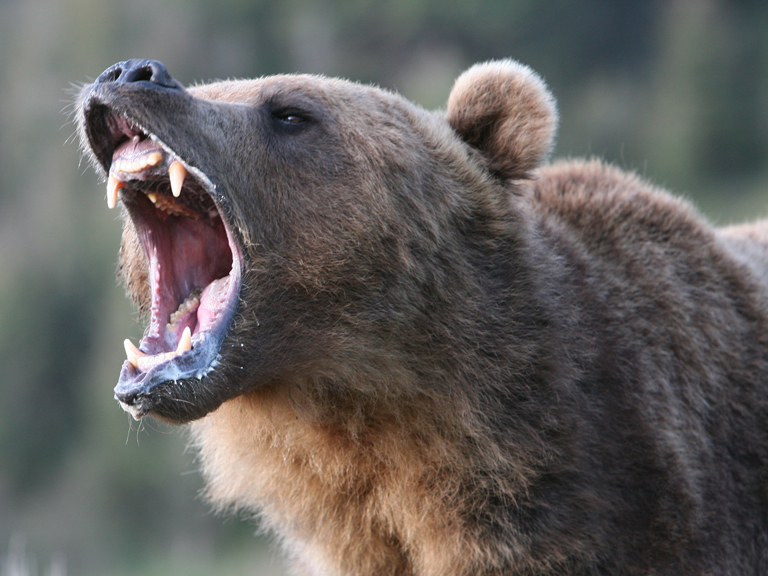 If a Bear charges at you and you’re not armed – play dead and cover your neck with your hands. This reduces the level of threat a Bear might feel and increase your chances of survival. iv. If you’re in a group – make as much noise as possible and do not split up – splitting up can cause the Bear to go after members of your party that are getting away. 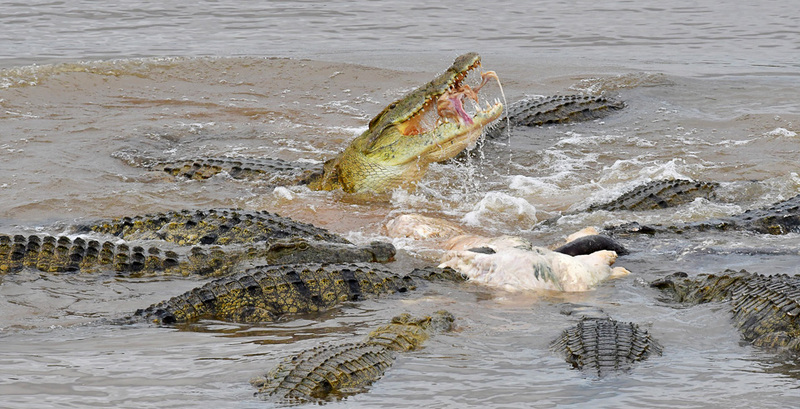 Surviving a dangerous encounter on safari with crocodiles. i. Avoid swimming in rivers that have Crocodiles in them to begin with. Test the waters out by throwing some stones into them to draw their attention. This will allow you to spot what’s lurking beneath the surface. iii. Should your boat capsize at any point, remain calm and do not draw attention to yourself. Swim to shore if you end up in the water and use breaststroke underwater as quickly as you can. Surviving a dangerous encounter on safari with hippos. Due to the strong bite of a Hippo – it is considered one of the most dangerous on African land. They’ve been known to kill other predators with a single bite – so you can only imagine the chance you’d stand upon an attack. ii. The Oxpecker lives on Hippos – so if you hear the call of an Oxpecker it’s usually a good indicator of any nearby Hippos, giving you the chance to get away as soon as possible. iii. Don’t attempt to get past Hippos unnoticed, especially in water. Beat the side of your boat to alert Hippos of your presence. Although they’re herbivores and don’t count humans as prey, they do not like being startled. iv. If a Hippo is definitely about to charge then climbing a tree or getting onto higher ground is the best chance of survival, because even a Hippo can outrun you, unfortunately. Surviving a dangerous encounter on safari with black or white rhinos. 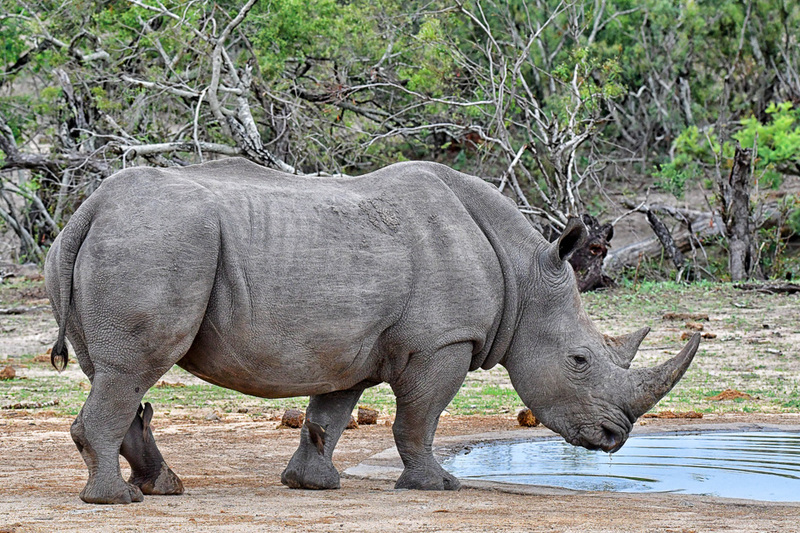 A Rhino’s eyesight is relatively poor which gives you an advantage should they be on the offence. In your state of panic you generally have three options: run away, distract or juxtapose. i. If you are around trees, stand where you can get the tree in between you and the Rhino, they tend to avoid large obstacles whilst running. ii. If you’re able to climb the tree, keep at least three limbs on at all times and use the power of your legs to propel you upward. iii. Try and run for a thick scrub bush if they’re around as a Rhino is very unlikely to follow you in to one. Whilst the thorns are not ideal, sustaining a few scratches would be far better than a fatal ending. iv. If there are no trees or scrubs around you – stand and face the animal head on. Making loud shouting and screaming noises will make the Rhino veer away from you as they tend to with noisy targets. v. Rhinos tend to run in the same direction once they charge – if they charge at you and you have a chance to get away, run in the opposite direction, as they have a very low chance of turning around and coming back for another attack. Surviving a dangerous encounter on safari with gorillas. A Gorilla society is very hierarchical, meaning there’s usually a dominant leader in a pack which you can use to your advantage. The silver-back in particular is one of the most aggressive of primates when encountered. i. Incorporate Gorilla behaviour by acting like one. Remember to not make eye contact and do NOT back away. The idea behind this is being submissive to the Gorillas and making them think you’re one of them. 1. Crouch down and be smaller than the gorilla if you can. ii. Try not to scare, scream at or hit the Gorilla. It is likely that it might grab you as a form of playful behaviour – but whatever you do, do not do anything that could cause aggravation. iii. If the Gorilla grabs your arm, do not try to pry the fingers apart. Their grip is tighter than any human and an attempt to break free could be fatal. 1. Try to ‘groom’ its arm whilst loudly smacking your lips. The idea behind this is utilising a primate’s natural instinct as groomers. 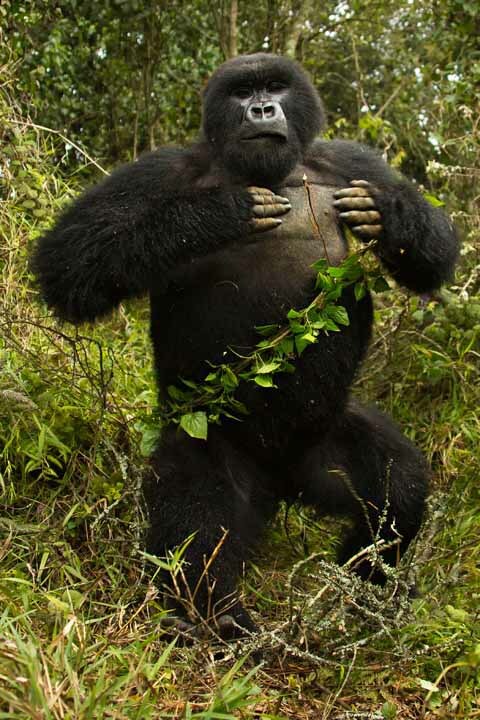 The gorilla should loosen its grip and as it does, move your grooming hand to any bits of leaf and dirt. Surviving a dangerous encounter on safari with sharks. It’s no doubt that an encounter with a Shark would be truly horrifying, particularly if you’ve seen the movie Jaws. However there are a surprising number of ways you can avoid the possibility of an encounter and increase your chances of survival. ii. 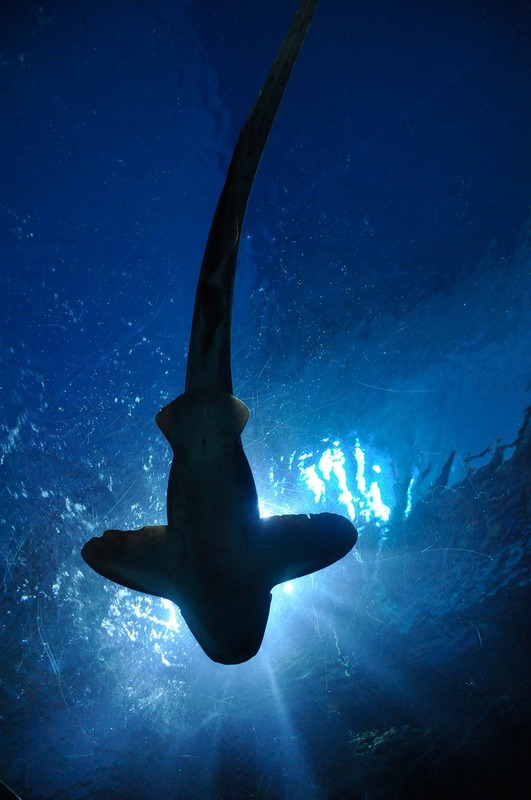 A Shark's sense of smell is so strong that it can detect a drop of blood in several hundred million parts of water. But what some people don’t realise is that sharks can also detect urine – so try not to pee in open water. Should you be menstruating or cut yourself, get out of the water, immediately. iii. If you’re caught – keep your head on a swivel and maintain eye contact at all times. Gradually try and swim backwards away from the shark, ensuring they’re still in your field of vision. iv. This is no Bear – so if they charge at you then hit them with all you’ve got in the nose, mouth and gill areas. If you have something on your person that can be used as a weapon – then even better. 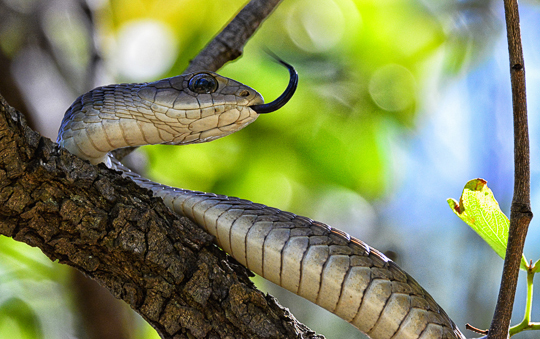 Surviving a dangerous encounter on safari with snakes. Snakes The vast majority of encounters are actually non-venomous, however out in Africa you’re very likely to come across the venomous types and you certainly don’t want to be picking them up and tossing them away (unless you’re trained to). i. Although a snake cannot hear anything, they’re able to hear vibrations. Make as much loud noise as you can to deter the Snake away. ii. If you spot a Snake and you’re close to it. Freeze and observe its reactions. If you back away very slowly then it will not perceive you as a threat. iii. As a very last resort you might need to kill it. The Snake is essentially a spine, so any significant damage to any part of its body will kill it. Use a large and/or heavy object and try to aim for its top half of the body – you’ll need to act swiftly whilst a Snake is ready to attack. - most charges are "mock" (threat) charges, the elephant is pretending to charge but is actually testing you out to see if you're aggressive or a non-threat. - Watch the elephant's ears. If an elephant's ears are relaxed, he is probably making a mock charge. Ears that are fanned out are indicative of a mock charge. 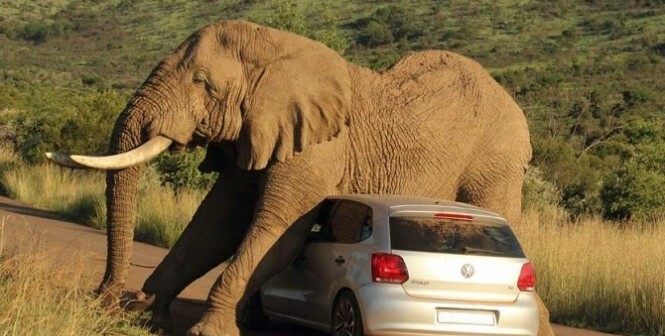 - If the elephant's ears are pinned back flat, it is likely that the charge is real. This will often be accompanied by a trunk that is curled inward. - Listen for warnings. You're likely to hear trumpeting of a warning from the elephant. - Look for displacement activities. There are some other indicators of an elephant working out whether to charge or retreat. These include a twitching trunk and swinging one leg to and fro. The biologist responsible for discovering this, Dr George Schallar, realized that the more pronounced these "displacement activities", the more likely the elephant was making a threatening show out of fear and had no intention to really charge. - Always try to stay downwind of the elephant. This way, the elephant will find it difficult to smell you and seek you out (elephants have a keen sense of smell). If you can hide downwind, you might be able to avoid any further encounter. If you do run, stay downwind to make following you more difficult. - If the elephant appears to be making a mock charge, you have the option of standing still. The problem with this is that it is very hard to do when an elephant is bearing down on you. It does show the elephant that you're non-threatening and it removes the desire to chase you. 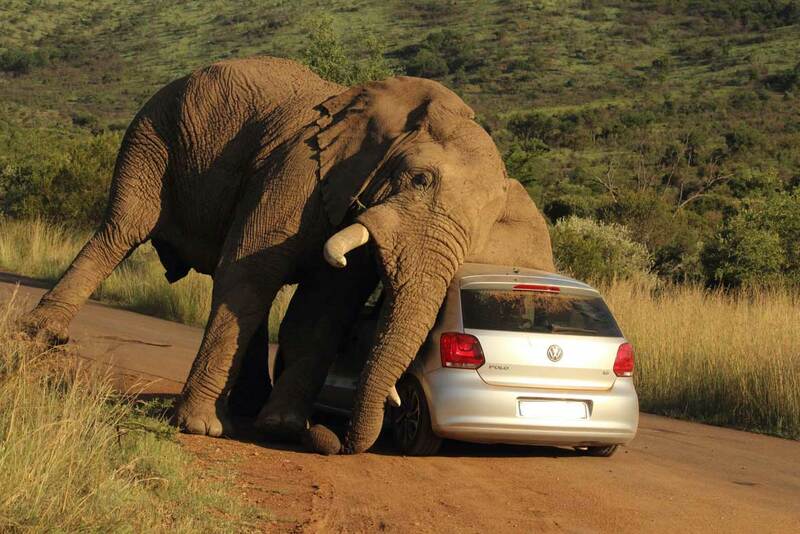 However, you'll need to judge the suitability of this move by the size and aggressiveness of the elephant before you. - Be noisy. It might be possible to shoo off the elephant by making loud noise if there is some distance between you and the charging elephant. Some think that this a very good option if you're inside a vehicle. On the other hand, if you're on foot trying to dodge the elephant when it's very close to you, others think that staying quiet is probably a much better option. - You can also shake trees, rattle bags, make noise using whatever objects are to hand. A loudly and repetitively shouted "No" is good if you can't think of anything else. - Do not show your back to the elephant. Do not turn or run! Running encourages chasing. - Look for something to keep between you and the charging elephant. Do a quick look around you to see if you can duck behind something larger than you or something that can act as a shield. - If there is a vehicle and you can manoeuvre it quickly enough, drive off. 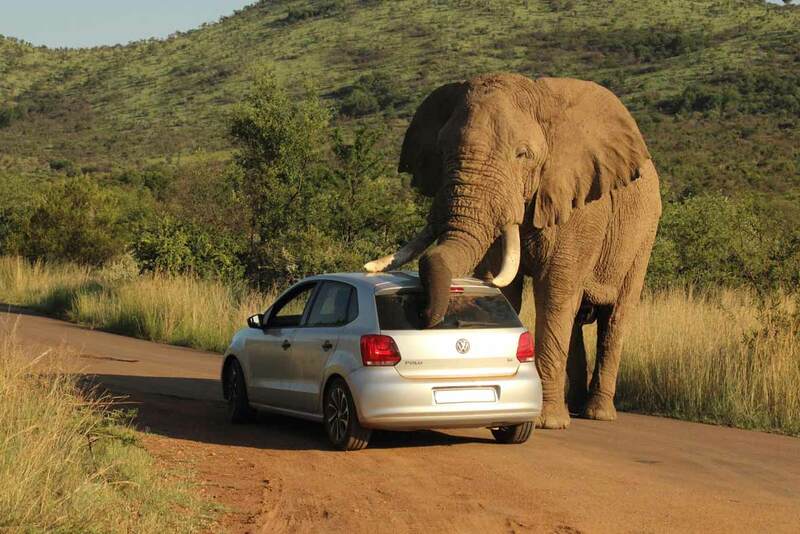 Be warned though, if the elephant is already close to the vehicle, it may charge the vehicle and you risk being tipped over and pounded. - If you must run, try to do it in a way that deceives the elephant. A charging elephant can run much faster than you but if you zig-zag, you might be able to confuse it. Elephants find it difficult to change directions due to their bulky size. And, of course, run as fast as you can––your life depends on it. - Climb. Elephants can't climb, obviously. And provided you find a sturdy enough tree of good height, it might be enough to put space between you and the marauding elephant. - Keep in mind that the elephant might rip the tree down, so be on the lookout for signs that it might try this next. - Be warned! It might not be wise to jump into water. Apart from the fact that the water might harbour other non-friendly wildlife, elephants are surprisingly good swimmers and it may decide to simply follow you. 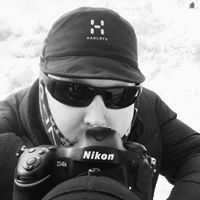 Wim van den Heever is a professional wildlife photographer based in South Africa and owner of Tusk Photo, who has had an ever growing interest in image-making and nature since a young age. His work is internationally published in the likes of BBC Wildlife and National Geographic. 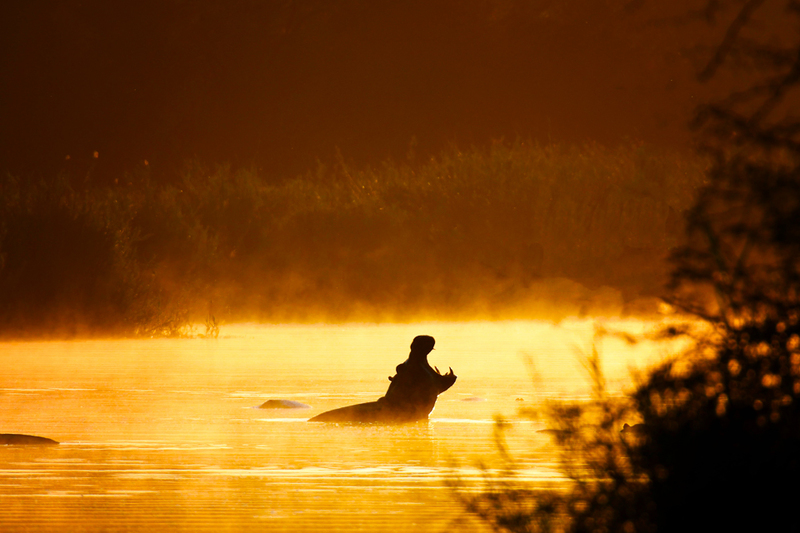 His ranges of safari tours are designed to show the beauty of African landscapes at their finest.